Cobblers forward Sam Hoskins has been nominated for the EFL’s Goal of the Month award for February after his wonder strike against Tranmere Rovers at Prenton Park. 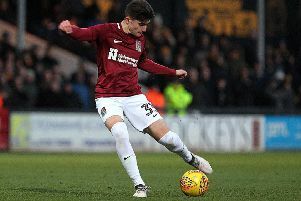 The 26-year-old’s inclusion as a sole striker for Town’s trip to Merseyside had caused much debate prior to kick-off, but he justified his selection and then some with a two-goal showing as the Cobblers ran out 2-1 winners over play-off chasing Rovers. Hoskins’ second was the talk of social media after he made a darting run to the front post and produced a wonderful first-time effort to flick David Buchanan’s cross over goalkeeper Scott Davies and into the corner of the net. Hoskins faces competition from Nelson Oliveira (Reading), Teemu Pukki (Norwich), Said Benrahma (Brentford), Alex Mowatt (Barnsley), Kyle Wootton (Scunthorpe), Jordan Graham (Oxford), Kaiyne Woolery (Swindon) and Illias Chair (Stevenage). Voting opens from 6am tomorrow (Saturday) on Skysports.com and closes next Monday. All winners are announced on March 15.